Traditionally called the High Priestess, this major arcana, or trump, card represents human wisdom. She can be viewed as a kind of female Pope, the ancient Egyptian Priestess of Isis, the even older snake and bird Goddesses, the Greek Goddess Persephone, or the Eve of Genesis before the Fall. For the accused heretics who were burnt at the stake for revering her in the 14th and 15th century, she symbolized the prophecy of the return of the Holy Spirit, which was perceived as the female aspect of the Holy Trinity. 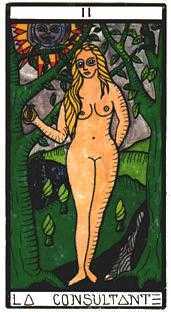 In the sequence of cards in the major arcana, the High Priestess appears as soon as the Fool decides he wants to develop his innate powers, making a move toward becoming a Magus. The High Priestess is his first teacher, representing the Inner Life and the method for contacting it, as well as the contemplative study of Nature and the Holy Mysteries. Posted on November 19, 2013 by ladyoftheabyssPosted in Daily Posts, TarotTagged Fool, Goddess, Greek Goddess Persephone, high priestess, Holy Spirit, Inner Life, Major Arcana, Pope, Tarot.